KUALA LUMPUR, Malaysia – May 21, 2013 – Nexx Studio, cool and colorful South East Asian indie mobile game developer, today revealed Bloom Box, their Springy upcoming puzzle game for iOS. The game tasks players with setting up chain reactions to shoot flower projectiles across the field to free trapped flowers. It’s a challenging mobile puzzler built around the domino effect. Bloom Box is set to blossom on May 29, 2013 in the App Store for iPhone and iPod touch at $1.99, but will be offered for just $0.99 as part of a launch promotion. Just in time for spring, Bloom Box is ready to let the flowers bloom across many colorful fields. Players are challenged with placing different types of blocks strategically on the field, without the constraints of a timer. Once lined up, lighting the fuse makes each block shoot flower projectiles in different directions to free flowers and collect stars along the way. 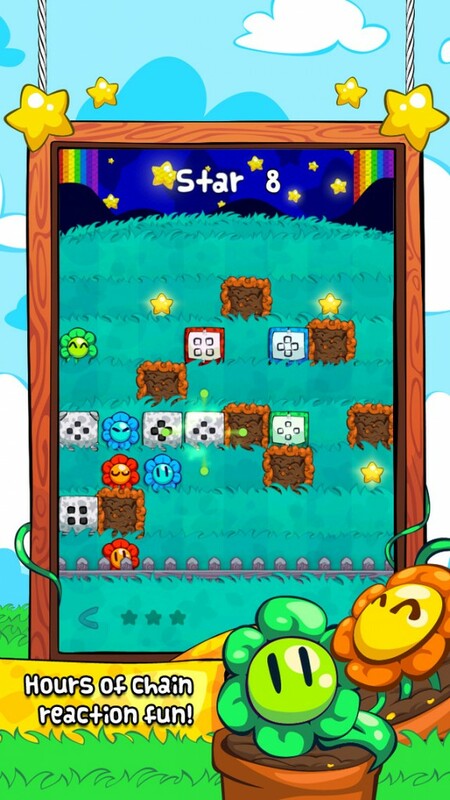 Activating chain reactions by lining up boxes in each other’s line of fire, while taking into account different types of boxes, is the key to collecting hard-to-reach stars and advancing to the next level. The more stars the player collects, the more gardens and levels they will unlock. Strategically place 5 different block types that shoot flower projectiles in different directions; free flowers from every box and collect stars along the way. Complete 120 levels across 4 unique worlds, the 4th of which is a bonus garden, each featuring different block types and puzzles of varying difficulty. Unlock new stages by collecting stars in each level! Earn up to 25 different Game Center achievements. Stuck? Use Facebook, Twitter, and e-mail to ask friends for help in solving the hardest puzzles. Share puzzle solutions on Facebook and Twitter as well to help stumped friends! April showers? No, you can thank Nexx Studio for bringing May flowers! Bloom Box sprouts on the App Store for $0.99 for a limited time only on May 29, 2013. Nexx Studio is an iOS game development and publishing company founded by Ken Wong on August 10, 2008. The 4-person team was incorporated in Kuala Lumpur, Malaysia in May 2011 after receiving its first seed investment. It has since produced 5 iOS game apps, which have collectively been downloaded over 16 million times on the App Store to date.